John was enjoying the sun so much at the outdoor café today that he didn’t even notice that he was the model. Because of his sunglasses I couldn’t tell if he was having a snooze or looking right at me. When I showed him the drawing he told me that he had been painted before and the painting was in a gallery nearby, but I never made it over there to see it. 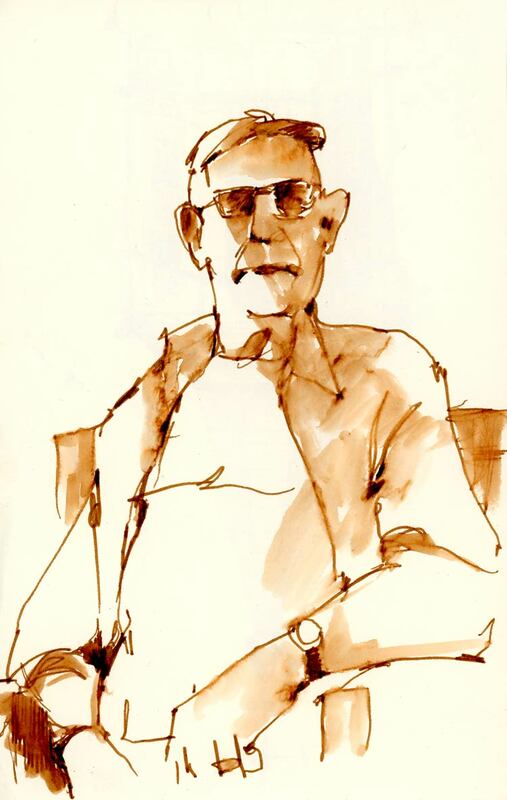 Sketched on the street in Burlington, Vermont, in a handbook journal with a Tombow water-soluble marker and a Koi waterbrush. The problem with working in a big sketchbook is that sometimes you can get overly ambitious. 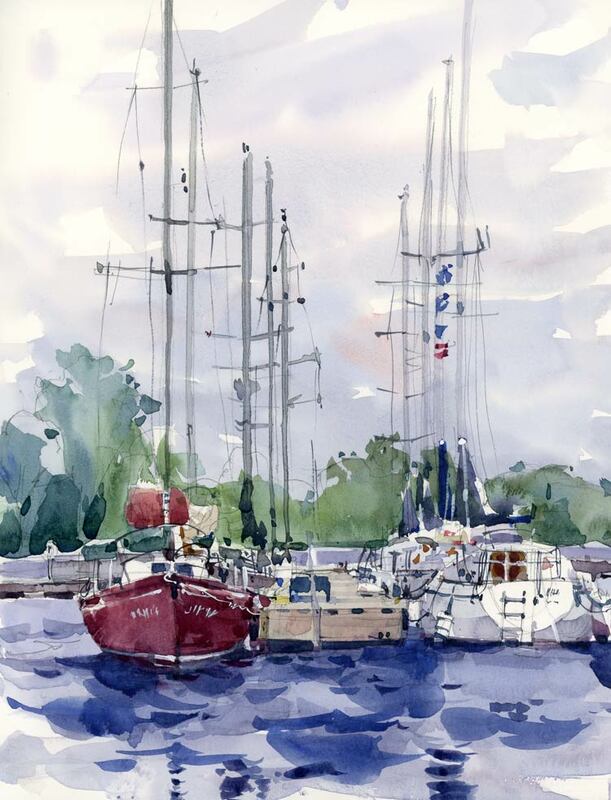 My original intention was to paint a one-page sketch of the sunlight crossing the boats on the right in front of the building, but then I noticed the wave movement of the trees and my sketch just kept going and going, right across the page towards the left, until I ended up with a double-page spread that is 17″ across. After it was done I realized that this might also work well as a painting, so I may go back there on a nice morning when the light is like today and paint it on a quarter sheet of good watercolour paper. Or I may do this in studio like I did with the Lobster Pool a few days ago. Some flowers gathered in the fading light, plunked in a plastic cup and painted in about 30 minutes… There’s not much more to say about these gracefully arching beauties except that they needed to be painted freshly and quickly. With cold and grey weather outside I thought it might be a good idea to catch up on some indoor stuff. I started by doing a long overdue cleanup of my studio and then moved on to a project that has been on my to-do list for some time. Last year I did a sketch of Ken (see below), the owner of the Rockport Lobster Pool, waiting outside his shop for a shipment of fish to come in. 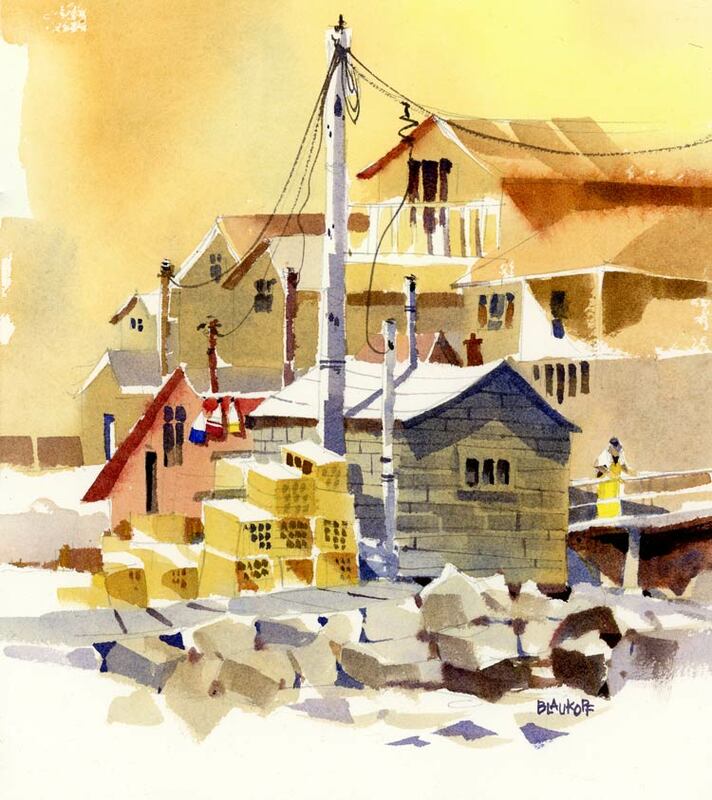 The colour scheme was influenced in great part by the yellow lobster traps and the colour of his apron, and it was created as a practice for my workshop at the Urban Sketchers Symposium in Barcelona. I showed the sketch to Ken before I travelled home, but couldn’t leave it with him since it was in one of my sketchbooks. 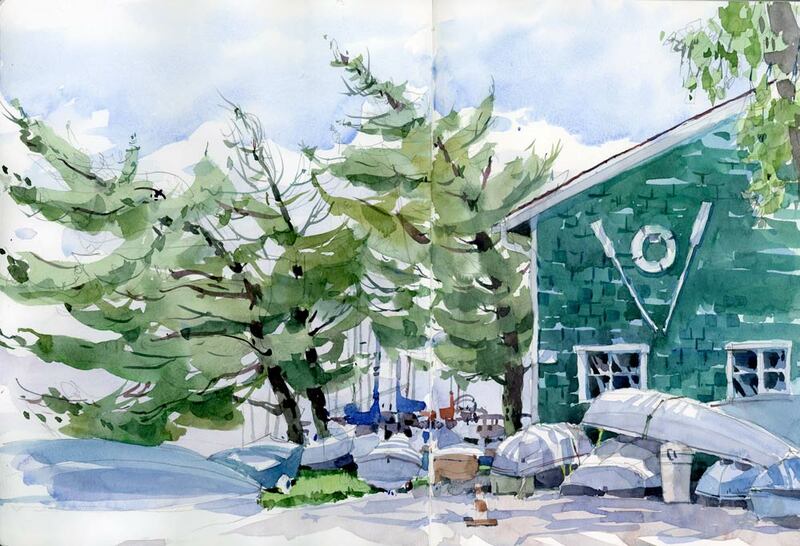 I left Rockport with a promise to return in 2014, painting in hand. Here’s the final painting. I used the same triad of colours as I did in the sketch (Azo yellow, Alizarin Crimson and French Ultramarine) and tried to keep yellow as the dominant colour. I also wanted to maintain the strong pattern of repeating shapes (triangles, squares) contrasted with the strong verticals of the utility poles. This was painted wet-in-wet on a sheet of Saunders Waterford CP, 260 lb, 10″ x 12″. Almost exactly a year ago I sketched this same scene at the yacht club. Looking at the previous sketch, I see that it was the same kind of day — overcast, chance of showers — but maybe not as cold as today. Last year Bill (in the yellow slicker) was on the deck of his boat but this year I only caught a glimpse of him as he disappeared down into the cabin, no doubt to get out of the cold. I can’t say I blame him since I painted this from my car studio. 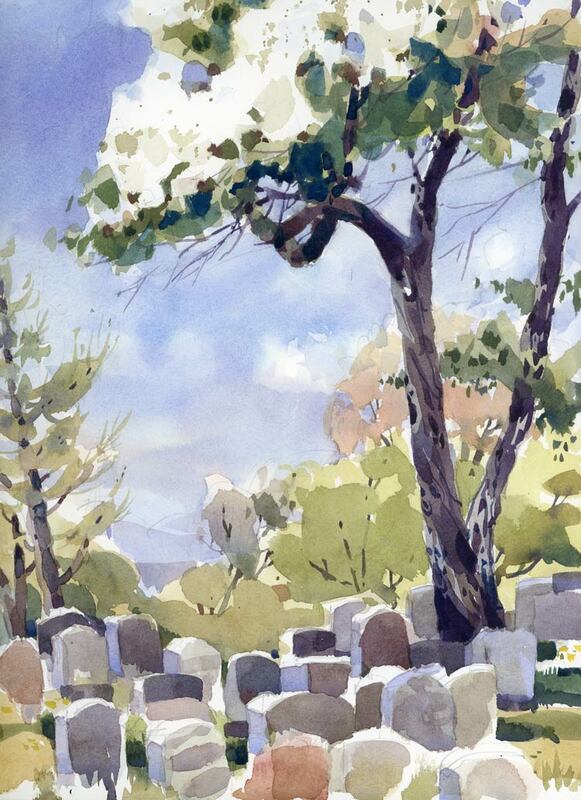 Apparently there are over 100 tree species at the Mount Royal Cemetery, and if I had taken the time to pick up a map at their office I would be able to tell you what the name of this white flowering tree is. But the cemetery takes up 165 acres on the slopes of the mountain, and that would have been quite a hike with my painting gear. As with many other areas of Montreal, I continue to discover treasures in my city by seeking out sketching spots, and this place certainly is a treasure, especially in the spring when it is all abloom. If you have any idea what this tree might be, I would love to hear. If not, I guess I’ll make the hike to get the tree map at the cemetery office. 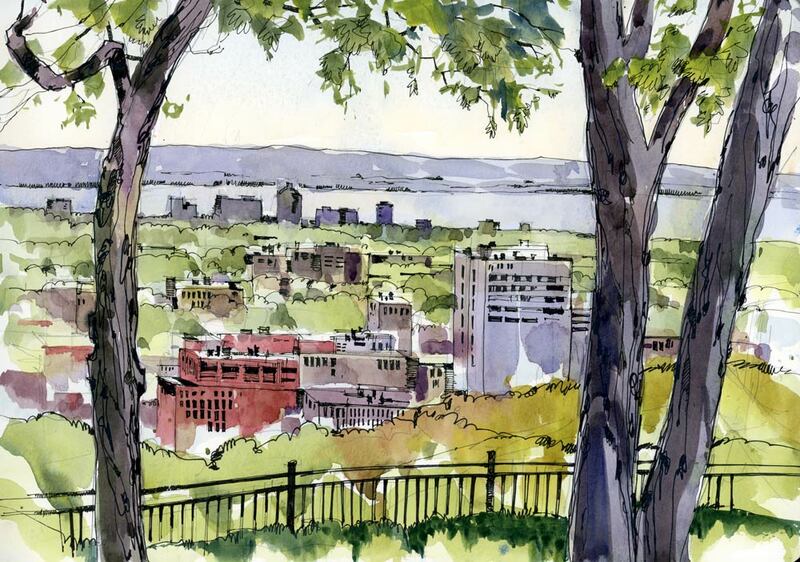 There’s no shortage of places to paint on the mountain but the classic view is from the lookout at the top, and it seems like all of Montreal was up there today. It was a perfect day in every way — spectacular spring weather, our best ever turnout for USk Montreal (I counted over 30 sketchers!) and all the trees in bloom. The view over the city was cloaked in haze. I tried to sketch it in pencil and watercolour but it was too mushy and soft in the moleskine sketchbook so I added some pen for structure. Thicker Sharpie lines for the foreground and finer Micron lines for the distant view.